1) In a large bowl mix the flour, bran flakes, ground almonds, bicarb, salt and cinnamon together. 2) In a jug beat the eggs with the milk, honey, oil and vanilla essence. 3) Mix the wet ingredients into the dry ingredients until well combined. 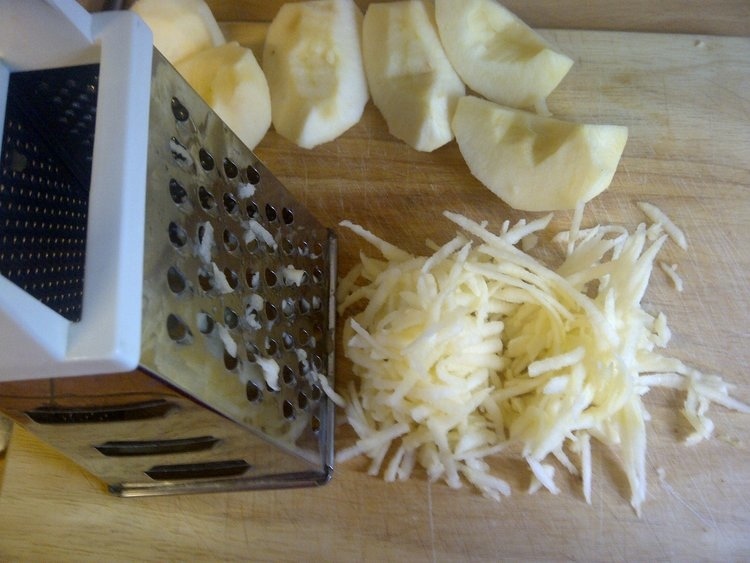 4) Peel, core and grate the apples. 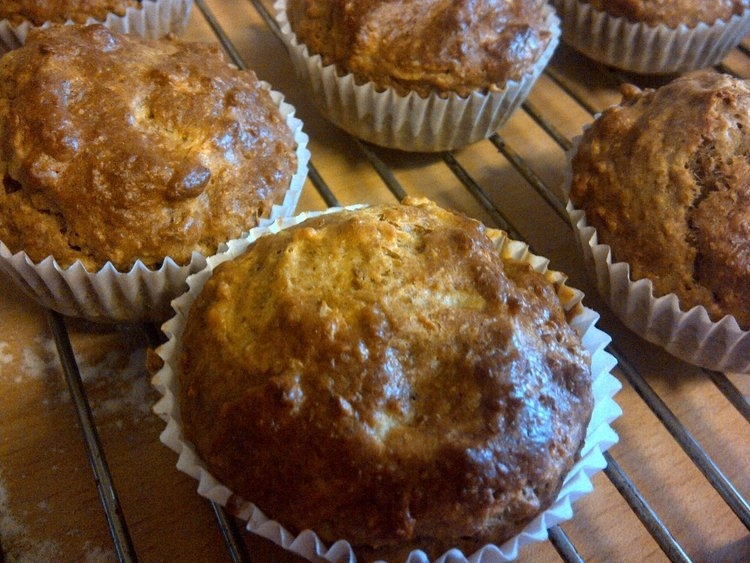 5) Stir the grated apples into the muffin mixture. 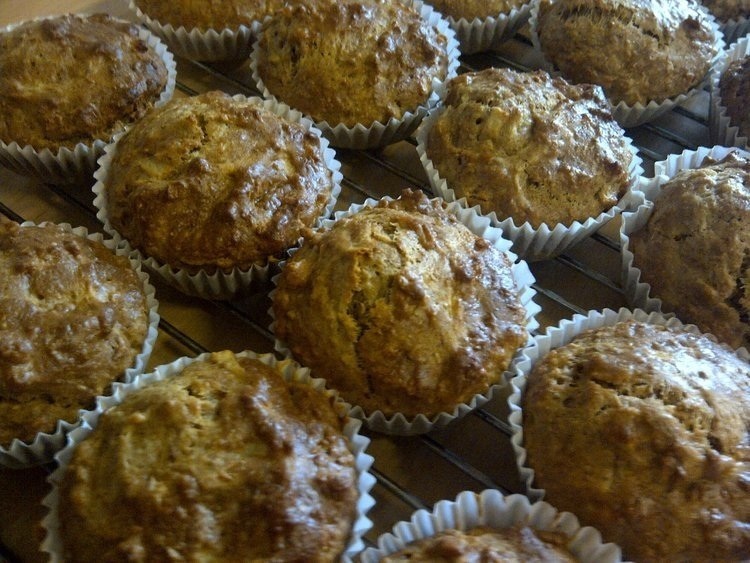 6) Spoon into 24 muffin cases. 7) Cook in pre-heated oven 170C/340F for 20 minutes. I was a bit concerned that they were overdone, because they looked quite dark on the top, but no, they were light and moist inside. These really are closer to bread than cake in terms of sweetness level, so they might not be to your taste, but this recipe is definitely one I’m going to remake. They are quite plain, so I might experiment a bit next time, like adding some chopped nuts which would add to their nutritional value as well as adding some texture. I’m also going to try increasing the amount of apple to see how far I can go with that without them going soggy! And I’m going to increase the ground almonds and cinnamon next time to see how that works. They seem to freeze well too, which is what I did with half of mine, ready to defrost a couple at a time as needed. Thank you! I quite like the rustic look that they have, but I do want to work on bringing a bit more flavour and texture into them. It’s a good basic recipe though (if I do say so myself!). Vanessa, I have the same problem with blood sugar and too-sweet things… way up! Way down. These sound great. Thanks for sharing your recipe–I have no problems with bready vs. sweet. Yum! Great, well if you make them, let me know how they turn out for you! I’m definitely thinking of adding the chopped nuts next time. Yes, I think so! They’re very easy too (although quite a lot of ingredients!). Yes, the ground almonds were just because I was looking through my cupboard wondering what else I could put in them, and found leftover ground almonds from when I made the macaroons a few weeks ago! There was half a cup left, so that’s what I went with. They look delicious. I agree that too sweet first thing in the morning can be a turn-off, so these seem like they’d be a nice, hearty alternative. Do you think bananas over apples would make them too mushy? Thank you. It’s hard to say about the bananas isn’t it, I was worried that the apples may give off water and make them mushy, but they didn’t. Maybe if you used bananas, you’d need to cut down on the milk or something? I think I would look at the balance between wet and dry ingredients on a banana bread recipe to get a clue about substituting here – I’m certainly no expert! Ha! I hope they worked out for you if you made them. Yours probably came out better than mine with the special Niki touch! Believe it or not I haven’t made them yet AND the bag of apples are still good…?! Is that even possible? These apples must be posessed LOL! Yes, I thought you might like these. I think they’re a good base recipe that can be added to and experimented with!